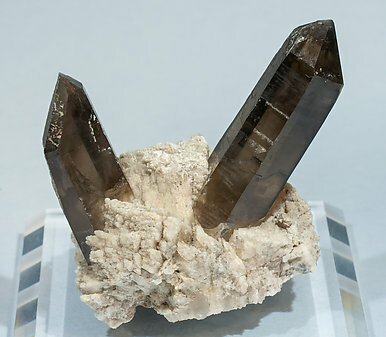 Two doubly terminated crystals that are transparent, extraordinarily bright, and slightly smoky, with inclusions and with curious areas, very limited, of nearly amethyst color. An American classic. 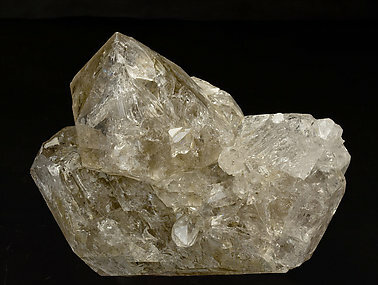 Group of Quartz crystals, one of them dominant, doubly terminated and with very sharp faces and edges. Although its uniform smoky tones are not very deep, the transparency is excellent. In the Folch collection card one can read that this sample, collection Nr. 4.147, was obtained by exchange in 1950 with Herr Sulzbach from Zurich (Switzerland). An excellent and interesting miniature. 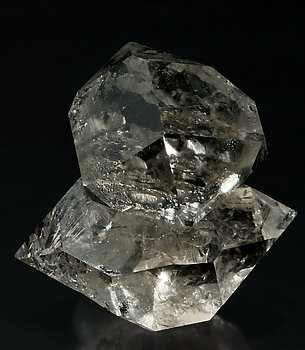 A group of doubly terminated crystals, very transparent, bright and slightly twisted (gwindel) and with parallel growths on terminal faces. A classic Swiss Quartz. 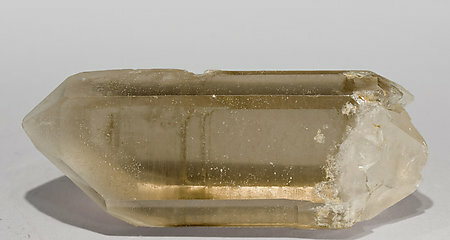 Doubly terminated crystals with a scepter termination at one of its terminations, very well marked by an evident change of color, that changes to white. A novelty at the Ste. Marie-aux-Mines 2015 Show. 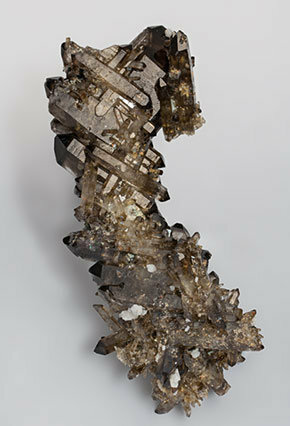 Excellent example in which the two directions of the smoky Quartz crystals have been controlled epitactically by the feldspar upon which they grew. They resemble multiple Japan law twins but they are not twins. 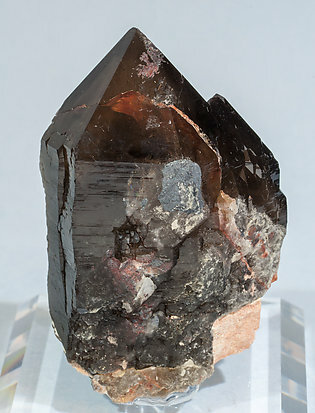 This phenomenon is seen on similar specimens from the Erongo Mountains, Namibia, as described by John White in an article in Rocks & Minerals, vol. 87, Sept./Oct. 2012, pp. 459-462, but this one has a related combo of small species, classics from Malawi. 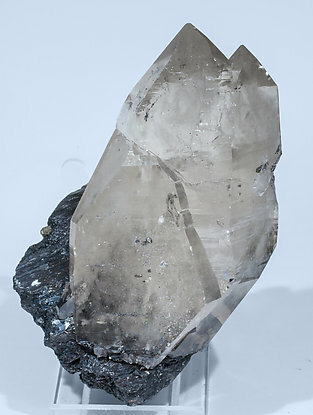 From the last mining works that tried to exploit again the Quarries in Lumbrales, a very interesting Quartz crystal with sharp faces and edges, and a slight and uniform smoky tone at the top, milky at the base. One can see some geometric hoppered growth forms. With Orthoclase and kaolinized Mica. 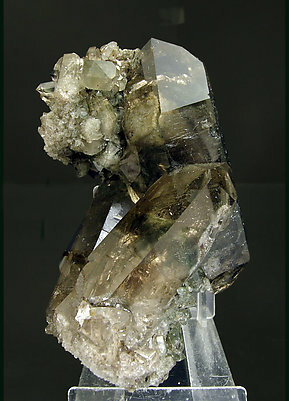 Aggregate of crystals, one of them clearly dominant, with window (“fenster”) growths in some of their faces and a particularly intense “glassy” luster. The better samples from the Grant Quarry, aside from their scarcity, are especially appreciated by advanced collectors due to their quality, and the neat inner growths. 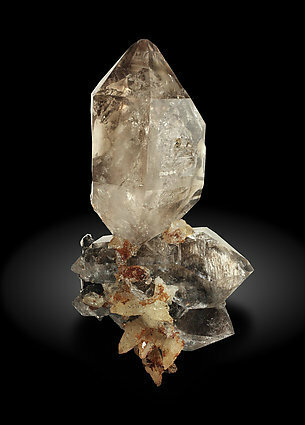 Group of Quartz crystals practically dipyramidal, with a scant development of the prism. They are very bright, rich with inclusions and have very evident “window” growths. 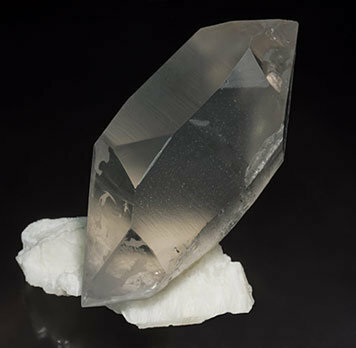 Complete doubly terminated Quartz crystal on a white platy Feldspar matrix. It has very well defined left-oriented faces and exhibits Dauphiné twinning. Very esthetic due its aerial position on the Feldspar matrix. 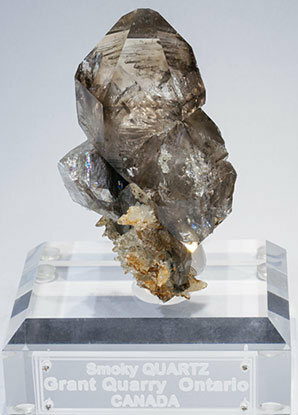 The specimen has been published in the magazine ‘extraLAPIS’ on page 22, number 53, "Zwillinge"
Two isolated Quartz crystals (smoky variety) with very well defined faces and edges, transparent and bright, with a deep and uniform smoky color. They have grown on a matrix of Albite crystals. 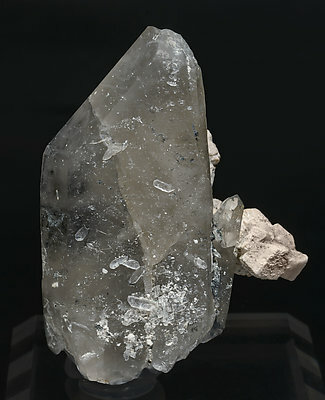 Aggregate of crystals, one of them clearly dominant, with window (“fenster”) growths in some of their faces and a particularly intense “glassy” luster. 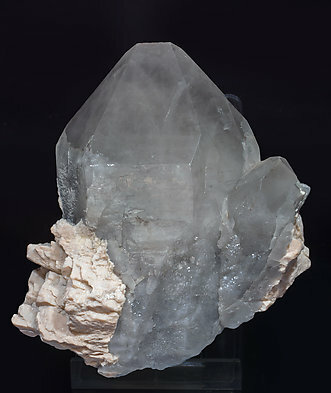 The better samples from the Grant Quarry, aside from their scarcity, are especially appreciated by advanced collectors due to their quality, and the neat inner growth forms. 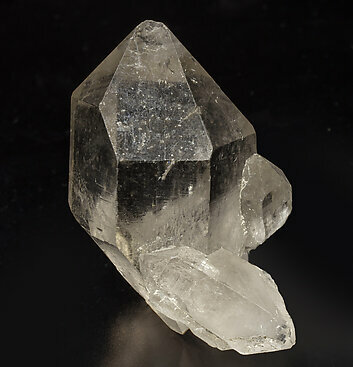 Floater complete Quartz crystal, extraordinarily flat, with a very uncommon shape and bordered and partially coated by small crystals of an indeterminate Feldspar. The locality is very unusual. 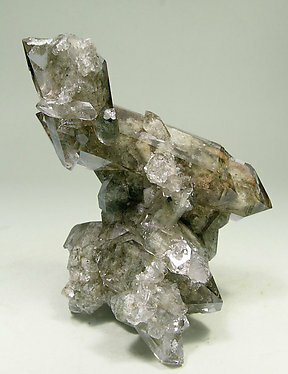 Parallel growth of very sharp Quartz (smoky variety) crystals. 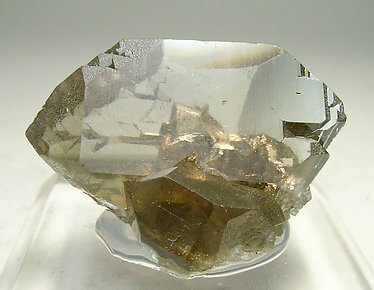 They are partially doubly terminated, transparent, very bright, with inclusions, and are on a matrix of crystallized Ferberite with small Pyrite crystals. 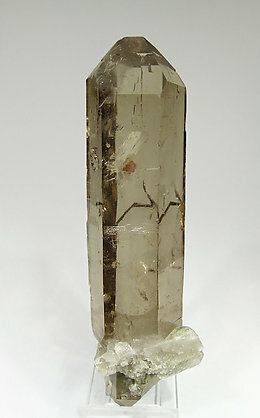 Single smoky Quartz crystal, transparent, very bright and with a very deep and uniform color, with Hematite inclusions on its terminal faces and with very visible right-handed rhombohedral faces. An interesting novelty of Tucson 2008 due to the quality and locality. 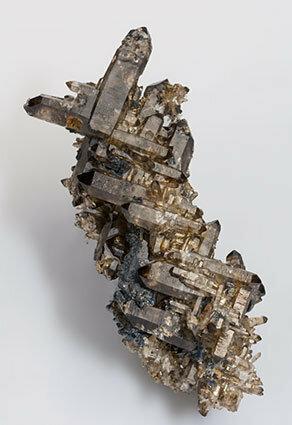 Group of smoky Quartz crystals, some of them doubly terminated, with well defined faces and edges. 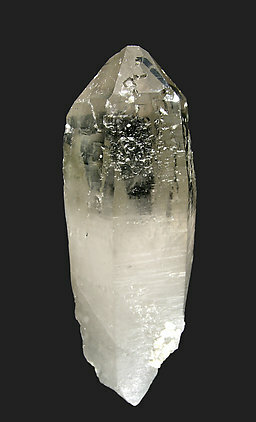 Crystals are quite transparent with several inclusions, among others Chlorite. 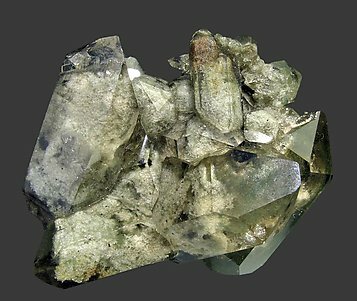 Floater group of crystals, all them doubly terminated, bright, with very well defined faces and edges and very rich in Chlorite inclusions. An interesting novelty of Tucson 2008 due to the quality and locality. 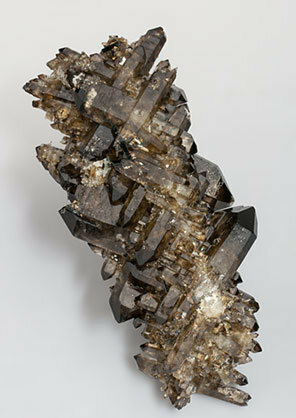 Group of smoky Quartz crystals, one of them clearly dominant and doubly terminated, with well defined faces and edges. 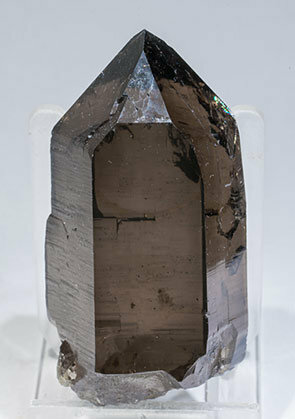 Crystals are transparent with several inclusions, among others Chlorite. Doubly terminates crystal of excellent transparency, luster and color and with abundant and esthetic inclusions. We must note slight damage on one of the terminal faces but we are sure it does not detract from the quality of this excellent sample. 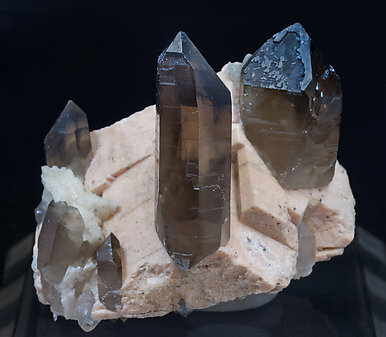 Quartz crystal with very well defined parallel growths, with a very deep smoky color, very bright and with Microcline on the matrix. A pair Quartz crystals, one of them clearly dominant, bright, translucent, with a smoky phantom growth and with a small Microcline matrix. 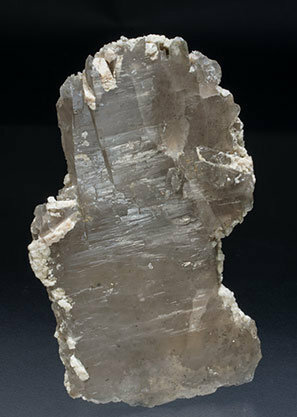 The sample is from a very uncommon Catalan locality and it is one of the best Quartz samples we know from there. 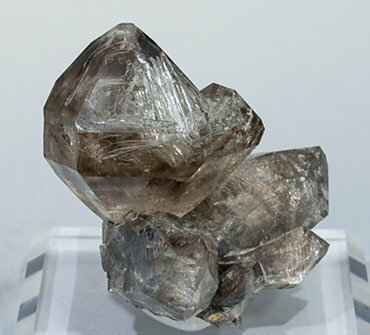 Quartz (smoky variety) crystals that are bright, transparent, have a very deep and uniform smoky color and are implanted on a matrix of Microcline crystals with a small group of Albite crystals. Two partially doubly terminated Quartz crystals, one of them clearly dominant, very flattened, with fine superficial recrystallization of the same Quartz, and with parallel growths of Orthoclase crystals.